Last night it rained on and off, and this morning I woke up to leaden skies. Quite a change from the past few days! Fortunately, by the time I was done with breakfast and had checked out, the sun made an effort to break through. It only succeeded for minutes at a time, but I didn't let the weather deter me. The fact that it wasn't exactly cold (high fifties initially, later warming to the high sixties) made things easier. 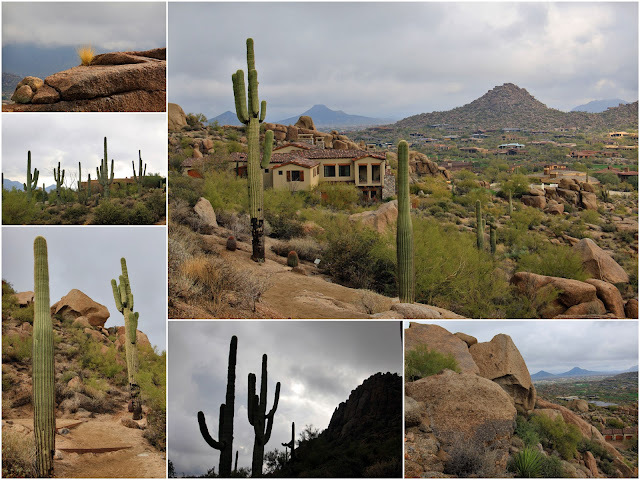 Stop #2 was another place visited by Pam Penick in April 2015, George “Doc” Cavalliere Park in northern Scottsdale just a few miles from Pinnacle Peak (see below). 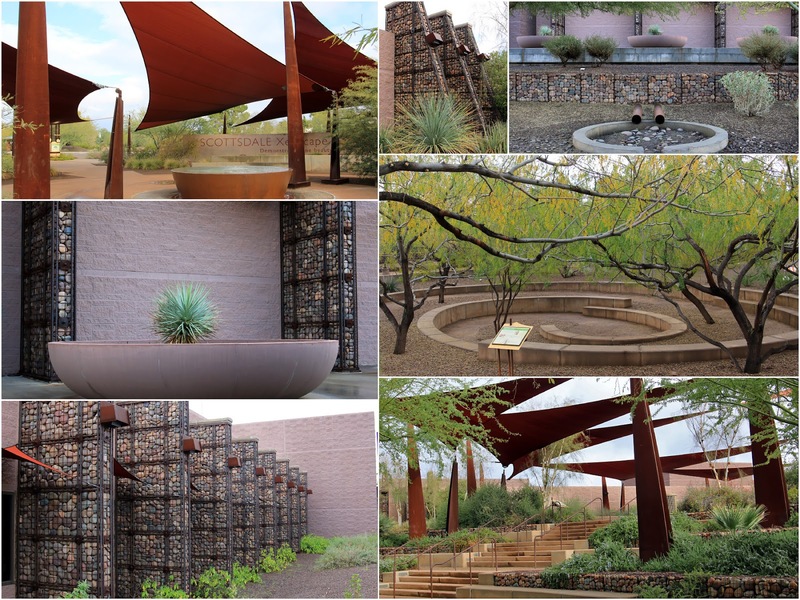 Cavalliere Park officially opened in February 2012 and preserves 34 acres of Sonoran desert in the middle of upscale housing developments. A major focus was on stormwater retention; an earthen dam and two retention basins ensure that 100% of the stormwater is captured. Like the Scottsdale Xeriscape Garden, it makes liberal use of Corten steel and gabions, including gabion stairs. 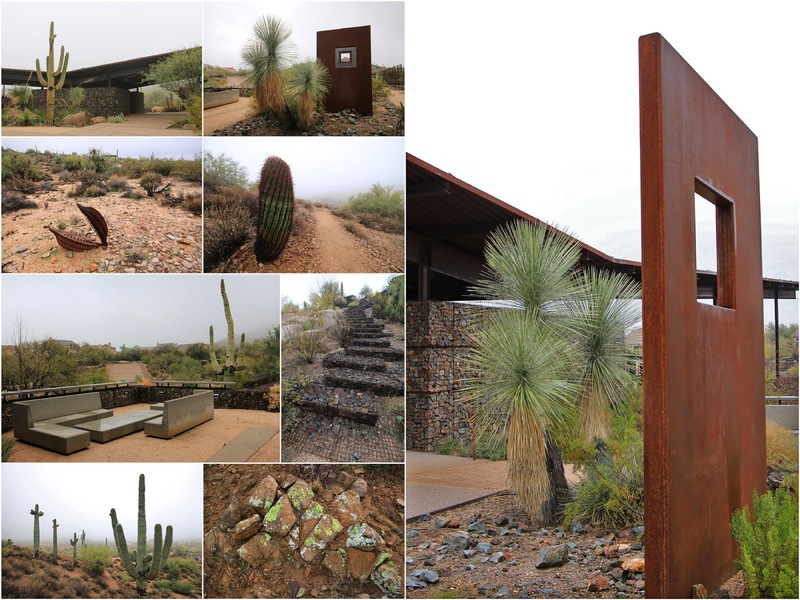 I took the 1-mile trail that goes up and around the hill at the eastern edge of the park and walked in complete silence among mist-shrouded saguaros without ever seeing another person. If it didn't sound so preposterous, I'd call it a transcendental experience. My next stop was only a few miles down the road, Pinnacle Peak Park. Pinnacle Peak is a granite "mountain" that rises 600 feet from the valley floor and can be seen from pretty much anywhere in northern Scottsdale. A well-groomed 1.75 mile trail (3.5 miles roundtrip) goes up and around the peak, affording spectacular views. I had schlepped myself maybe half of the way up when the sky opened up and I got soaked--a bit unpleasant even though it was close to 60°F. Still, it was another memorable moment! 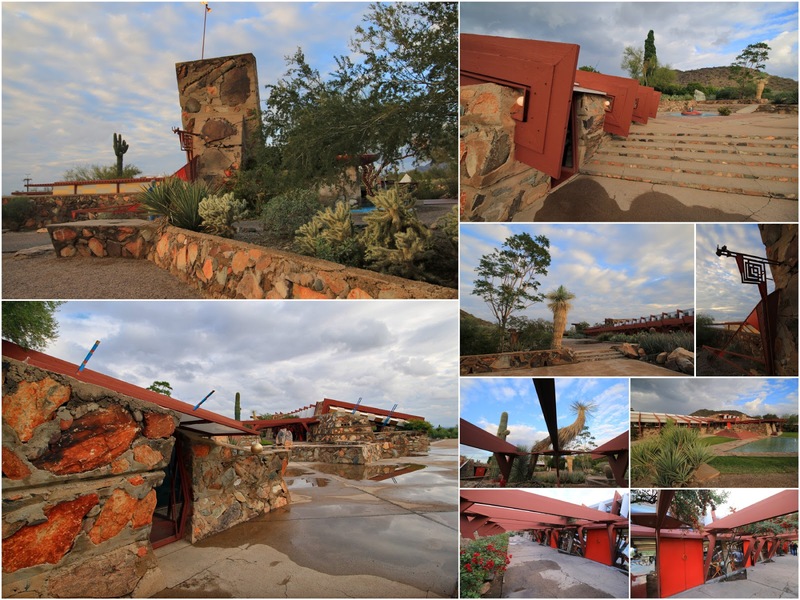 My final stop of the day was Taliesin West, the winter home and architecture school of Frank Lloyd Wright. I had done a tour in 2013 but wanted to go back, especially on day when the light was less contrasty. If you have even a passing interest in architecture, I can highly recommend a visit. Unfortunately, you must do a tour to see the campus. Here are a few photos; I'll show you more in a dedicated post. This was the final stop on this year's trip. After Taliesin West, I headed to Sky Harbor Airport to make my way back home. Another unforgettable desert trip has come to a close. If all goes well, I'll do it again next December! Love some of those architectural details, and the sun sails are a detail I've always wanted to explore in designs. I'll have a lot more photos of architectural details. I'm obsessed now with the combination of steel, gabion walls and stonework on the one hand and desert flora on the other. The sun sails at the Scottsdale Xeriscape Garden were absolutely fantastic. You're probably joking, but the thought did go through my mind! I wonder if there's anybody in the greater Sacramento area that would even know how to build a gabion wall! Looks like there is a gabion stairway at Cavalliere Park? I've always wondered if that could work. We did the hike at Pinnacle Peak when we were there. It was a great walk, with nice views and plant ID sighs(!) but wow it was packed with people. It appeared to be a very popular place. Yes, that's a gabion staircase at Cavalliere Park. It was surprisingly sturdy. Clearly, the key is to use strong steel wire for the "cages." Pinnacle Peak was busy when I was there (New Year's Eve). I can only imagine what it's like on a sunny winter weekend! I've been to Pinnacle Peak a few times, it's a wonderous place. I wish I'd been as meticulous in my planning as you. I was extremely close to your Pam inspired spots when visiting my brother in October. It would have been so easy to pop over there. Sadly I did not. Looking forward to your posts! Oh no! I think you would have liked those places. But there's always next time, assuming your brother won't move anytime soon. Arizona has no shortage of rock! I love all the gabion structures. That's for sure! I can only imagine how time-consuming (and labor-intensive) it must be to build a gabion wall.